The last time we heard from American metalheads Skeletonwitch, they were offering up a rare track courtesy of Adult Swim's Metal Swim compilation. The free download of "Bringers of Death" was well worth it, but we were hoping the thrash troupe would unveil more than a measly song to follow up 2009's monstrous Breathing the Fire. While the group haven't announced when they will unveil another album, the outfit have lined up a trilogy of seven-inches to satiate the teeming masses. A press release explains that Skeletonwitch recently re-recorded some tracks off their long-out-of-print debut, At One with the Shadows, and are ready to celebrate that feat by laying those tracks down on some limited wax. The first item, which will be released via Prosthetic Records next week, features the At One with the Shadows title track on the A-Side and "Bringers of Death" on the flip. The record will be pressed as a one-time-only run of 500 copies on gold vinyl. The other instalments are expected sometime early next year. Guitarist Scott Hedrick admits that the band are hard at work writing their next album, but hopes fans will appreciate these rarities in the meantime. "As we look toward the future, we thought it would be fun to release a few tracks from the past," he said in a statement. "We often get requests for these songs and are happy to have them back in print, complete with new artwork from our drummer, Mullet Chad." You can order the "At One with the Shadows" single now via Prosthetic, whom start shipping out records next Monday (November 15). 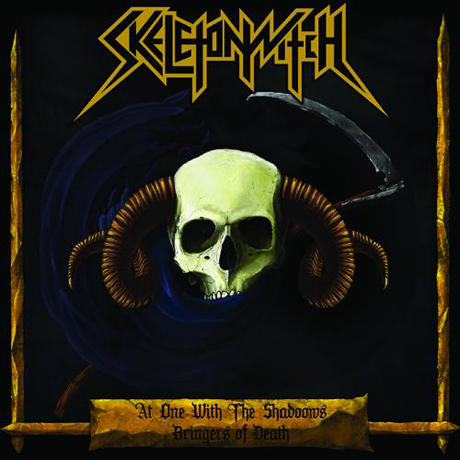 Skeletonwitch "Red Death, White Light"